At 5 a.m. I pulled myself out of bed into the still-dark morning. It was late May but cold in the Lamar Valley of Yellowstone National Park as I loaded into a car with three other people and my graduate adviser’s spotting scope. Later this morning I would be driving north with my adviser to a study site in Waterton Lakes National Park in Alberta to join her field crew. While in Yellowstone I had seen a grizzly, a pair of moose, and more bison and elk than could be counted—but no wolves. I had seen, looking down the valley, a wolf-killed elk carcass in a stream and watched it until nearly dark. I had seen the long line of cars, following Rick McIntyre’s bright-yellow Xterra, like the wolf paparazzi, as he searched for a signal from the wolves’ radio collars. Still no wolves. This morning I would join the throngs of enthusiastic wolf watchers before leaving Yellowstone. I had come west to study the effects of wolves on aspen forest communities. I thought I ought to make an effort to observe them in the wild. Yellowstone is a strange place. Upon arrival we had stopped at the visitor’s center. Elk, habituated to human presence, milled about the parking lot and lounged in the grass beneath trees that were scattered in islands amidst the asphalt. 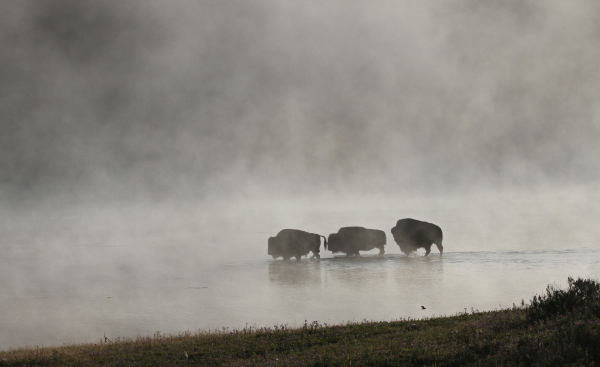 The ideal of Yellowstone is to be a template of North American wilderness. All of the species that existed here at the time of the Lewis and Clark Expedition are present. But can a place so impacted by the human gaze—not to mention our infrastructure—truly be called wild? Or does such a question reveal an underlying assumption that humans are not and cannot be wild? In his seminal 1861 essay, “Walking,” Henry David Thoreau writes, “In Wildness is the preservation of the world.” This is often misquoted as “In Wilderness is the preservation of the world.” But wildness and wilderness are not synonymous, and the difference between the two is important. Wildness is to wilderness as wetness is to water. Wildness is a quality of the wilderness, yes, but not bound to it. There is wildness, though muted and sublimated, even in the cities and suburbs. If nothing else, evolution—a function of the wild, to be sure—still presses on. The wilderness is tangible. Perhaps that is why the misquotation of Thoreau has propagated as much as it has. In contrast, wildness is intangible, immeasurable. Wildness is like the dao, a Chinese term that translates to “the way,” referring to the natural course of things; the underlying processes that shape the universe. As “the dao that can be spoken is not the true dao,” the wildness that can be measured is not true wildness. Nonetheless, I will attempt here to measure it with words, and so circumscribe its meaning. When I was beginning my master’s program in conservation biology, ruminating on my thesis topic, my advisor sent me an essay she had written for an upcoming book. The essay was called “Quantifying Wildness.” The title alone sparked the ideas that would eventually become my thesis: can wildness be quantified and measured? Perhaps not directly, but with wildness comes wilderness, and in its tangibility, wilderness has structures and processes essential to its functioning, which can indeed be quantified and measured. These structures and processes are indicators of wildness. In Zen terms: though they may not be the moon itself, they are the finger pointing to the moon. Although I set out to define these indicators of wildness broadly, on a continental scale, this would become an unwieldy task. I pared down and settled in to focus on aspen forest communities. There are three major indicators of wildness in aspen communities: predation, disturbance, and connectivity. These are likely relevant indicators in most, if not all (or nearly all—there are always exceptions in ecology) community types. The importance of predation in the regulation of ecosystems was first proposed by Hairston, Smith, and Slobodkin as an explanation of why herbivores do not overconsume their resources. The effect of keystone predator removal, which releases herbivores from regulation and allows them to consume vegetation to the point of suppression, is called a trophic cascade. Keystones predators are defined as a single dominant predator that preferentially consumes a particular species of prey, which helps to regulate the populations of other organisms. When keystone predators are removed from ecosystems, herbivore populations increase and behavioral patterns change, such as where they browse and the amount of time they spend browsing. These effects have been recorded in nearly every biome on earth. In aspen communities, without wolf predation, elk populations will overbrowse aspen, a vital winter food source for them. This can lead to the conversion of rich aspen habitat to lower quality conifer habitat and displace the species that rely on it. In aspen ecosystems, fire is the essential disturbance agent. Aspen are an early successional species, meaning that given time they will be outcompeted by conifers or, as in eastern forests, mixed deciduous species. Fire keeps them on the landscape where they play a keystone role in Western habitats. Fires, which occur in many aspen-rich landscapes as frequently as every thirty years, interrupt a growth suppressing hormone called auxin. Aspen is a clonal species, meaning that each individual tree is actually part of a larger connected root system of a single organism. Aspen clones reproduce by sending up new sprouts from their roots, called suckering. Although several other conditions can produce root sprouting, fire promotes the most vigorous suckering. Fire is a necessity to the reproductive cycle of aspen trees. Connectivity, in this context, refers to how connected or fragmented the landscape is. Landscape connectivity is essential for the movement of organisms and populations of organisms across multiple habitats. Such dispersals and migrations are essential for maintaining populations with both genetic viability and ecological effectiveness. People are becoming increasingly aware of what conservation biologists have known for at least the past few decades: we are in the midst of an extinction crisis. Fragmentation of the landscape and, by extension, the habitats supported by those landscapes, is the driving factor behind these extinctions. Fragmentation is caused, in part, by the increasing use of land by a growing human population. As fragmentation proceeds, the number of habitat patches and their insularity increases while their size decreases. This contributes to the loss of biodiversity. E.O. Wilson estimates that about 27,000 species go extinct each year, far outpacing the natural background extinction rate. The effects of fragmentation are further exacerbated by climate change, which displaces climatically sensitive species who may be unable to reach suitable but unconnected habitat patches. These measurable qualities indicate how wild an ecological community is. In this case, they specifically indicate the wildness of aspen communities. Restoring these processes is a key strategy in rewilding, a conservation practice developed by conservation biologists Michael Soulé, Reed Noss, and John Terborgh. Rewilding focuses on the conservation of entire core ecosystems on a continental scale, connected corridors of habitat, and conserving carnivores as keystone species. Soulé and Terborgh abbreviated this model to “cores, corridors, and carnivores”—also known as the “Three Cs.” In addition to the Three Cs identified, disturbance—whether through fire, wind, flooding, or otherwise—is a necessary process for resilient and wild ecosystems. I have already compared wildness to the dao. In finding consonance with these ecological processes, we will likewise be consonant with the wild, and our ecosystems will be more wild and resilient as a consequence. However, in Chinese philosophy, it is understood that you cannot strive to follow the dao—it is what happens naturally. Asian Studies scholar Sarah Allen describes water as the root metaphor of the dao. “Water spontaneously moves downward,” she writes. This is what allows water to follow a riverbed. It does this without effort. It is the natural state and characteristic of water. This quality of being in consonance with the dao cannot be manufactured. This is referred to as wu wei, which can be translated to effortless action (or more literally, “not doing”). Everything follows the dao, which is to say wildness is an inescapable quality of existence. There is no forest in which the wild is not present. The difference between wilderness and non-wilderness is not that the wild is present in one place and not the other; it is that wilderness practices wu wei, and so it follows the dao, the wild, perfectly and without effort. For the rest of us, there is too much effort, too much self-conscious minding. The phrase “think like a mountain” has practically become a cliché of environmentalism and conservation. The implications of this statement, however, are deeper than might be superficially supposed. On the surface it might seem that what Leopold is saying is that we must consider our actions from the mountain’s perspective—that is, to consider our impact on the whole environment. Rather, Leopold was speaking of the wildness the mountain knows. He is speaking of what the mountain values. Leopold writes about killing a wolf and his immediate regret as he watched “a fierce green fire dying in her eyes.” He writes, “I was young then, and full of trigger-itch; I thought that because fewer wolves meant more deer, that no wolves would mean hunters’ paradise. But after seeing the green fire die, I sensed that neither the wolf nor the mountain agreed with such a view.” To think like a mountain means to see the interrelationship of wolf and mountain and all the myriad living things—how the life of the mountain depends on the life of the wolf and vice versa. What the mountain thinks and what the mountain does—the whole mountain ecology, from wolf to elk, from elk to aspen, from aspen to lichen and fire and serviceberry shrubs—are indistinguishable: the wu wei of mountains as they follow, like a riverbed, the wild dao. After visiting Yellowstone, I spent two weeks in the more rugged wilderness of Waterton Lakes National Park, across the border in Alberta. Much of our work occurred on a very active carnivore corridor. There were fresh grizzly tracks every day. Something happens to the human mind when it becomes keenly aware that humans are not the apex predator in a landscape. A grizzly might have shown up at any moment, necessitating that we defer to it and leave. A confrontation, if we pushed it, would not likely end well. Having to stay alert to predators while moving as skillfully (and usually without much grace) as possible through backcountry thick with aspens, shrubs, and plenty of “shin-tangles,” my mind settled into new rhythms of perception and thought. I touched a deeper wildness than I could have otherwise imagined. The wu wei of working in, of being in wilderness flows directly out of an openness to the wu wei of the wilderness itself. This, ultimately, is how we rewild the landscape: we rewild ourselves and let our conservation action flow, like a river, effortlessly out from our own wild nature. That’s what the mountain knows, and that’s what we must come to know.